There is nothing more important in Dentistry than caring for children. Brushing morning and night with a fluoride toothpaste containing greater than 1450ppm of Fluoride. Think of fluoride as a chemical varnish – it soaks into the tooth when we brush and soaks out again when we eat. Every time we brush we top it up again, and again, and again…. And as long as we keep doing it, we get a chemical protective coat that stops decay. Eating – anything that contains sugar will create plaque – this is the white build up on our teeth. Plaque produces acid which dissolves the tooth surface to create a hole (or cavity). It’s not the amount of sugar that matters, it’s how often we eat it that matters. Danger foods – obviously sweets! But also sugary cereals in the morning, cereal bars, grapes, dried fruits, cakes and biscuits. Drinks – contain 2 dangerous components – sugar and acid. The sugar creates plaque, which causes decay, and also acid which quite simply dissolves the outer shell of your teeth, and when it’s gone, it’s gone! We call it erosion, and it is a part of tooth surface loss. Fizzy juice and fruit juice are just the same – sugar and acid. Juice and children produce worn down teeth eaten away with decay - not good. 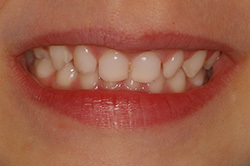 Milk teeth start erupting around 6 months and continue to erupt until 30 months. Each child gets 20 milk teeth, 10 upper and 10 lower. Milk teeth are lost at 2 stages, around age 6 and age 12. Age 6: the front 4 milk teeth, top and bottom, are replaced, one for one, with an adult tooth - so 8 fall out and 8 come in. In addition the 6 year molar adult teeth erupt at the back of the mouth. They erupt behind the last milk tooth bringing the total at this age to 24 teeth. Age 12: the remaining adult teeth, 12 of them are lost over a period of a few years and 12 adult teeth appear in their place. Behind the last tooth, the 6 year molar, another molar erupts bringing the total to 28 adult teeth. Wisdom teeth usually erupt in the late teens or early twenties. Throughout your child’s dental development we will be keeping note of their pattern of growth and if we need to, we will arrange for orthodontic care. Childsmile is a national programme in Scotland provided by the NHS to promote and actively prevent dental disease. There are a team of Dental Care Professionals who attend nurseries and schools to encourage a healthy diet, provide tooth brushing advice and place fluoride varnish on our young children’s teeth. Our practice is part of the Childsmile programme and we will provide families and carers with young children all the information and support necessary to help develop a decay free dentition for our very important children patients. Please link to www.child-smile.org.uk for more information. It is so important that your child feels comfortable visiting the dentist and the earlier the better - we recommend a visit as soon as the first tooth appears so that your child gets used to the surroundings and we can advise on healthy diets and good tooth cleaning techniques. Your child's wellbeing is paramount and maintaining a healthy smile for life is our ultimate aim. Time, patience and a caring attitude encourage even the most reluctant child to become confident in the dental environment. We recognise that many people fear a visit to the dentist and this may be due to a traumatic experience in childhood. As your child grows up we will continue to offer preventive advice and keep a check on their dental health and development. Hopefully we can set and keep them on the road to a disease free mouth for life. Don’t forget - tooth decay and gum disease are preventable. Many children suffer with poorly aligned or misplaced teeth and we can offer an appropriate referral to an 'orthodontic specialist' should this be required. Unfortunately, some children do experience dental decay and we are on hand to treat this, quickly and gently. As parents your support is vital and we will keep you informed at every stage. If there is something you are not sure of, please ask – remember – there is no such thing as a daft question! Dental trauma is always upsetting and is more commonly seen in children than adults. Accidents happen in life; fortunately we can usually repair the damage with ease. If your child is an aspiring Rugby, Hockey or boxing champion, protect their smile with a mouthguard. We recommend the “sport shop” type mouthguard in the developing mouth and a custom made mouthguard when all the adult teeth have erupted. On the subject of prevention we can also offer your child 'fissure sealants'. These are a tough protective coating applied to the grooves in the biting surface of the teeth (usually the adult molars) as they erupt into the mouth (approx 6 years of age for first molars and 12 years of age for the second molars ). This is when the teeth are most vulnerable. Food can trap into these grooves and result in decay to these teeth. Treatment is painless and can be carried out by your child's dentist or by one of our hygienists. If you would like further information about any of our children’s services please contact us on 01292 263550.